Events of the last couple of weeks on the political spectrum in Uganda has been both interesting and confusing. After many days of uncertainty and legal drama the Go Forward Team might have been surprised when out of the blue the IGP wrote to them clearing them to start their consultations nationwide. Some argued the reason for this clearance was in a way to test the waters and gauge what threat or potential JPAM could pose. Many pundits had already given up on JPAM arguing that his presidential bid had been stopped cold in its tracks and any form of ambition for the top job had been diflated and no one would take him seriously going forward. In a way he was being set up for humiliation. How wrong! The rest is history. In retrospect the interviews which NRM party stallwarts gave in the media saying JPAM is over rated and he could NOT even pull a crowd, in a way came back to haunt them. The evidence was overwhelming. 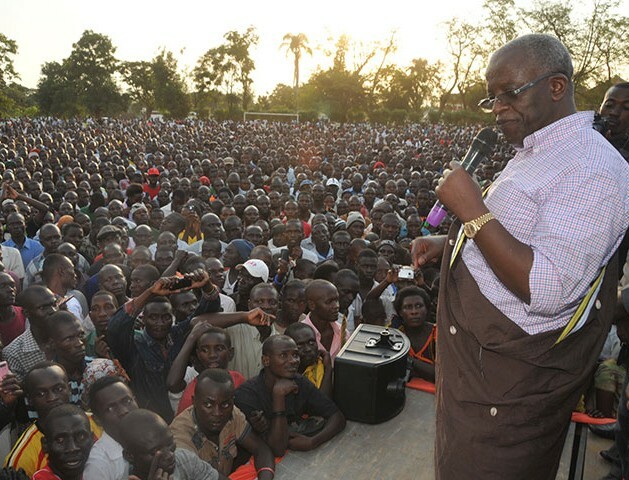 Now there are all kinds of actions or counter actions to deal with this JPAM tsunami, to the chagrin of the incumbent . So if the hurried release by the authorities to allow JPAM to consult was in a way to catch him off balance or ill prepared. l think it was a serious miscalculation as evident by the rapturous reception and sheer numbers that he was able to pull on his consultative tour of the eastern region in Mbale, Kapchorwa, Soroti and Jinja. Even JPAM remarked that he has never been welcomed like that anywhere! Mbale was just phenomenal in their reception. We can only wait for what will happen in the central, northern and western regions that is if the authorities relent and if the trend continues nationwide, this may as well set the stage for JPAM and Co. to sweep the series for those who are sports minded. This certainly provides the sizzle all have been waiting for in our presidential elections. Going with what we see and read in the media the incumbent may have met his match and for a change it will not be business as usual, where the winners are already predetermined before the race even begins, the masses this time are loaded with anticipation and they seem to know what they want! Dont be surprised if record numbers turn up to vote. Be that as it may, these numbers should be a wakeup call for all of us and the significance of this is huge, the masses are saying something and its high time our present leaders listen. The status quo may not be sustainable after all and its actually possible to bell the cat. It remains to be seen if we can all read into this and not be in denial. Interestingly, only time will tell what the Besigye factor, Bukenya, Mao and the rest will add in this mix. The excitement going nuclear is an understatement. He has also been pulling crowds and if these two form a tag team as already speculated then we are in for an interesting ride. The question now is, who will be whose running mate? TDA needs to play smart and field two candidates if they hope to get any advantages over a formidable incumbent. All said, this is going to be the contest of the ages, whatever the outcome. Be sure the people are going to be vigilant in guarding their votes. All said and done, there is a possibility of actually seeing a peaceful transition of power for the first time in decades! And money or who has the most, may not change much of the outcome. One thing for sure though, surpporters of either will be flipping side occasionally. The thought of peacefully changing rulers, is no longer a dream but something desireable if we go with the pulse of the masses and their hope for change. What these numbers mean for Besigye or JPAM is that the people are ready for something new, fresh ideas and a new way of doing things or better put better service delivery. In order to get to this change they are willing to back whomever will deliver this change be it Besigye or JPAM or both! The opportunists on the other hand are going to have sleepless nights and many are already biting their nails with nervousness and making frantic calculations, it remains to be seen which side of the coin will prevail…heads or tails. The usual spin that the incumbent has strong support in the rural areas is going to be put to test. We all know of the population migration trends and its true people are moving from the rural areas due to abject poverty and all are coming to urban centers. This is why slums are on the increase as this is where these rural poor can afford accommodation. Its in these rural polling stations where most of the ballot stuffing takes place according to reports. In anycase, lets watch the space and see what the coming months will hand to us. What remains is for the electoral commission to harmonize the process of voter register verification with all the stake holders to ensure that no citizens are disenfranchised. Needless to say, what a race this is going to be. And it sure has all the hallmarks of a thriller. Lets seat tight get our drinks, popcorn and enjoy the drama! By Ambrose Ndiwulira — The author is a member of the Ugandan Diaspora Community. Wish journalists would avoid using abbreviations without description eg if writing for everyone then assume that not everyone will know who JPAM is.